Description: A granite memorial is engraved to read: "Veterans of Foreign Wars ~ Foster B. Towle Post No. 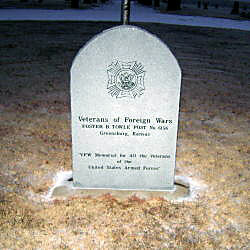 6156 ~ Greensburg, Kansas ~ VFW Memorial for All the Veterans ~ of the ~ United States Armed Forces". 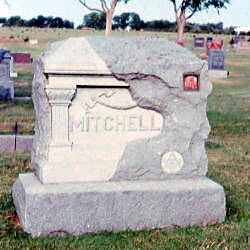 Description: The Mitchell grave marker contains a piece of hardtack. 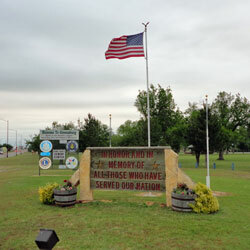 Description: TThe plaque reads: "In Honor And In ~ Memory Of ~ All Those Who Have ~ Served Our Nation".